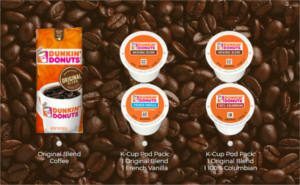 Answer the questions and fill out the form to get a FREE sample of Dunkin’ Donuts Coffee. You can choose from ground coffee or 2 k-cups. Not valid in Alaska, Hawaii, Idaho, Montana, North Dakota, Oregon, South Dakota, Washington and Wyoming. NOTE: If you answer No, No, it seems to qualify you for the free sample.